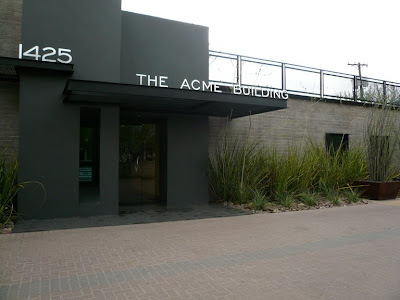 I think we can unravel the mystery of the Acme Building in Phoenix. In the Roadrunner cartoons, Wiley Coyote always pulled out the dynomite to try to blow up the Roadrunner from a box that would say "Acme Dynomite Co." The Roadrunner cartoons were undoubtedly set in the Arizona desert near Phoenix. So, perhaps your photo today shows the building where Wiley Coyote got his dynomite. Alas, Guy Noir would be proud. Phoenix now has one fewer secret. Ah, the ubiquitous ACME corporation! They're everywhere! Great photo and commentary. I love your blog. This made me chuckle! I used to listen to the PHC regularly when I lived in the US, now less often on Podcast.